You’ll be able to snuggle up in style with Katie Loxton’s new jacquard print blanket scarves and sweet sentiment scarves. Their best-selling bobble hats are back this season, now encrusted with glistening pearls for the sweetest of looks, perfectly matching their gloves and scarf! As well as the new adult bobble hats, the brand new baby bobble hats are the cutest addition for mummy and baby – they’re the ultimate in matching chic! Katie Loxton’s new season festive candles are truly enchanting, presented in a luxurious Christmas tree box and finished with glistening golden patterns. Whether you love hot chocolate or like Clementine and candy apples, we’ve got the perfect fragrance to make you feel oh so Christmassy! 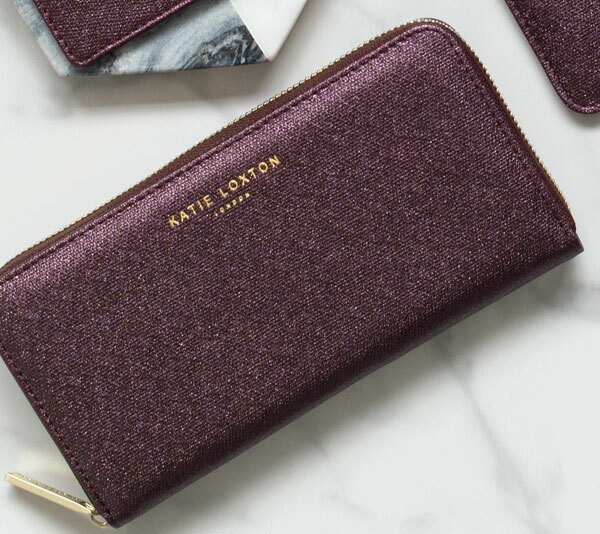 This Christmas our Katie Loxton collection is utterly gorgeous and we’re sure it’ll be on everyone’s wish list – From stocking fillers to the bag of your dreams, our AW18 Katie Loxton collection is filled with little luxuries, and we hope you love it as much as we do! 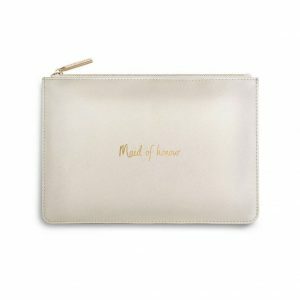 We are so excited by the new collection of gorgeous Katie Loxton bags, purses and Pouches this season. 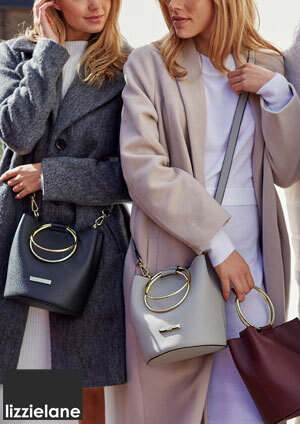 From shimmery additions to their Perfect Pouch range to they must-have new handheld bag, the Suki bucket bag, we think they really do have something for every occasion to keep you stylish this season! Be sure to shimmer thorough winter with these amazing new glistening Perfect Pouches. Finished in glistening gold, silver, deep Burgundy, navy and dreamy greys, they each have a perfect sentiment to choose from. Taking their style tips from the always-so fashionable French, the team at Katie Loxton have created their classic, ever-so chic French collection! We just love them all!, Oui, oui, oui! 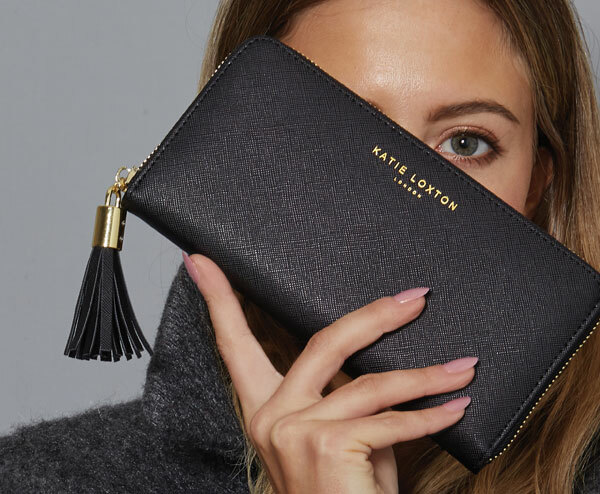 The stylish Secret Message pouches from Katie Loxton are back for winter with brand new additions! Each of these iconic pouches holds a unique secret message inside and is now available in metallic gold, silver and charcoal as well as new classic black, navy and mulberry. Finished with a detachable wrist strap that makes these clutches easy to wear and the perfect way to brighten every day. These beautiful slim pouches are the ultimate versatile pouch, perfect for stationery, make-up, day to day organising and little trinkets. Finished in must-have metallic gold or silver. The best-selling Florrie Tassel pouch is back. Each soft pouch is finished with a golden sentiment and pretty tassel charms that complete the look of these must-have pouches. 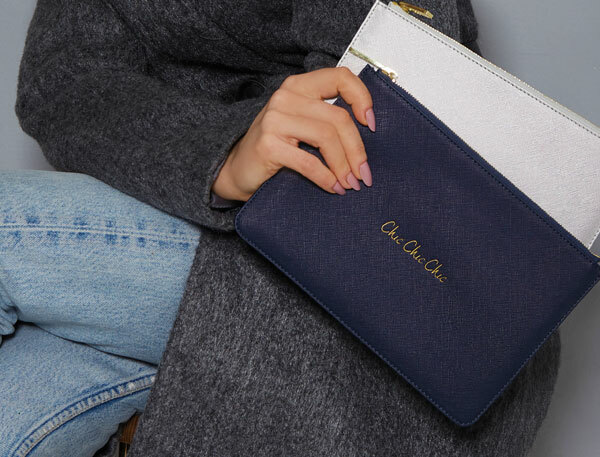 As well as the already popular pastel Florrie pouches, Katie Loxton have introduce a brand new collection in a range of wintery hues. Brand new for this season, the statement Krush Klutch is one of our favourite must-haves! Choose from metallic pink, gold, red or silver. We love the brand new Valentina Clutches. 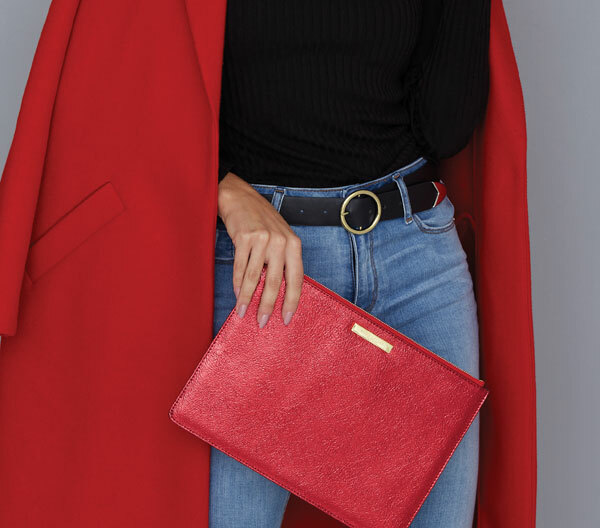 This glamorous over-sized clutch bag is perhaps the most exciting new addition within the AW18 collection. 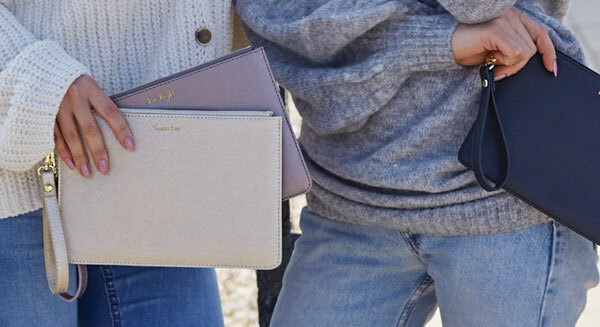 Each of these iconic clutches is finished in a crushed Valentina material with classic Katie Loxton zipper and can be folded for versatile wear. Available in 4 superb colours; crushed blue, crushed sapphire, crushed berry and crushed taupe. The ever-popular little heart coin purses are back in the ultimate sparkly finish, sure to see you shine and shimmer through the season! Available in sparkling black, ruby and champagne. 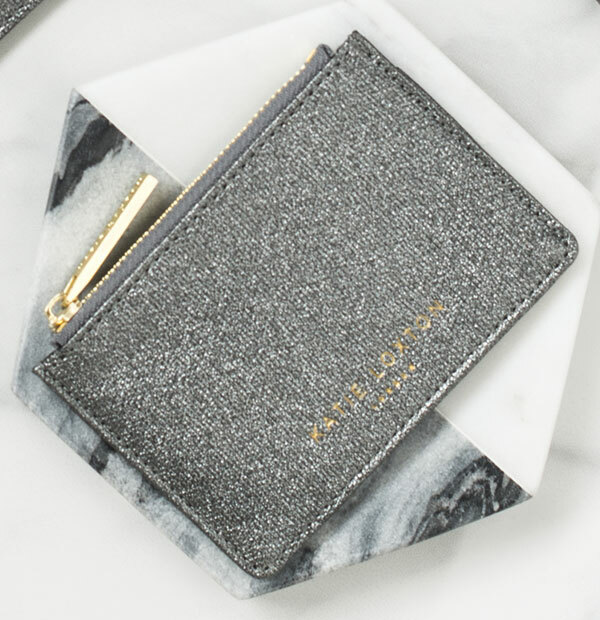 In addition to the new Alexa Shimmer Purses, Katie Loxton have also introduced these adorable, yet practical Alexa Shimmer Card Holders. Available in 6 matching glistening colours, they make a perfect addition to your shimmer perfect pouch easing you from day to night! The best selling Tassel Purses are back and this time they’ve added a brand new black version to the already popular collection. This mini version of the Chloe bucket bag is the ultimate day to night bag. Small, but perfectly formed, it fits your everyday essentials in style and is now available in metallic silver. Lets do lunch in style. Brighten every lunchtime with the brand new Katie Loxton lunch bag, sure to make the office green with envy! 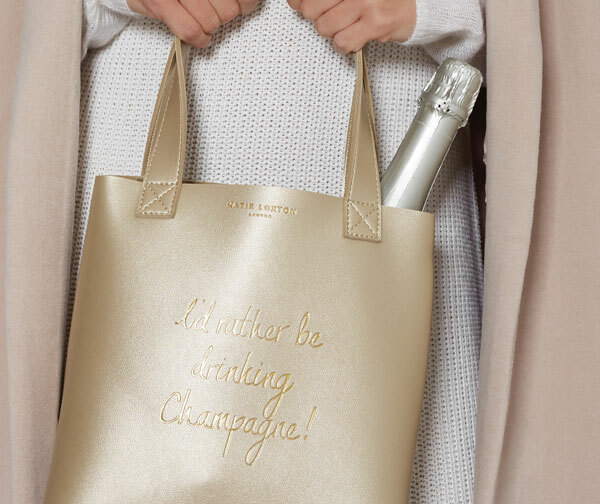 Or if you’d rather be drinking champagne, why not take it for a picnic in the park. Available in metallic gold and silver, complete with poppers to secure your contents. Lunchtime never looked so chic! 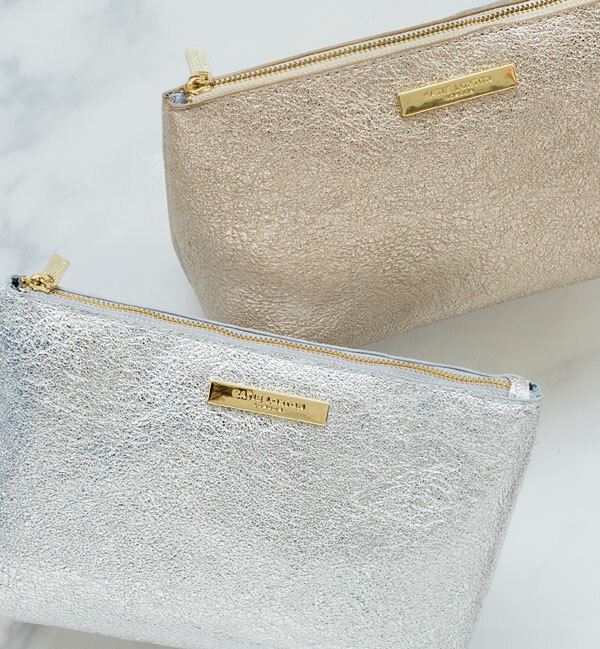 These glam Mia make-up bags add a bit of style to your everyday and available in stunning metallic gold or silver, we love them both. 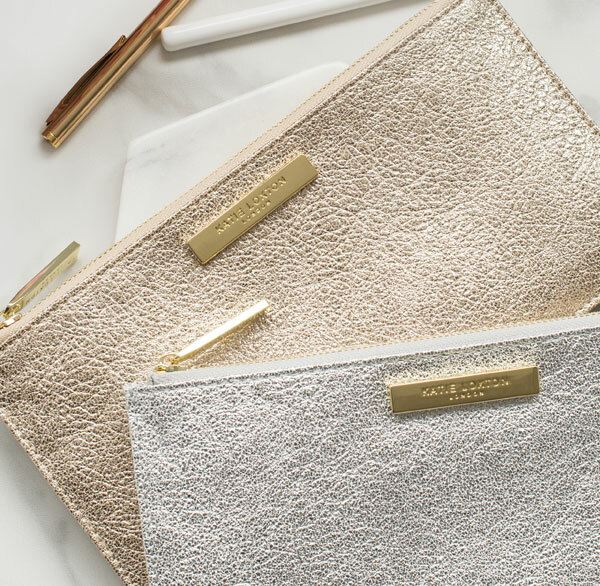 Finished with a gold Katie Loxton logo bar and a luxurious silky lining, they’re the perfect little deluxe accessory. 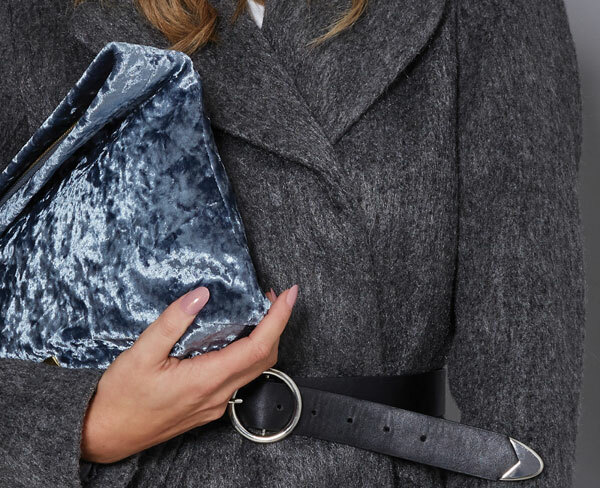 The popular Florrie bag is back in heavenly winter hues. Designed to be a chic everyday bag, the Florrie is now available in black and burgundy, as well as the already popular grey and pink and is finished with fabulous side stitching and statement tassel. The best selling Avery bamboo bag is back! Lined with a soft suedette material this must-have piece is finished with golden hardware and beautiful natural bamboo handles. Finished in black, taupe and grey they are utterly chic! We love the new Amelie Bamboo Bag and know that your will too! Welcoming a new bamboo addition to the Katie Loxton hand bag collection with the Amelie Bamboo magazine bags. 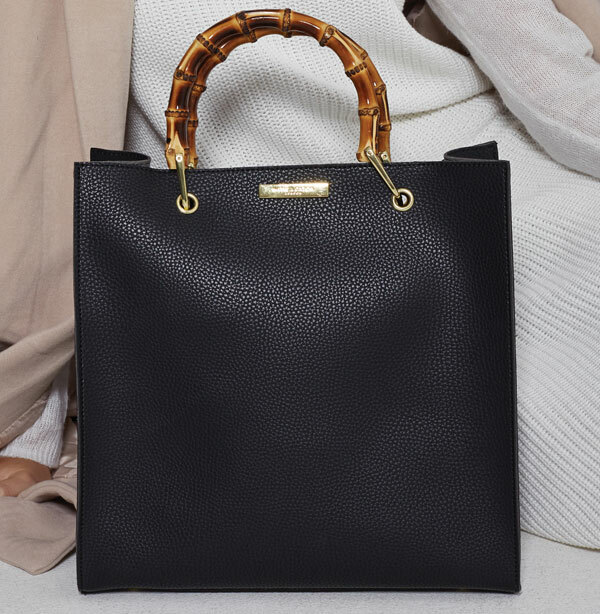 Available in a black or grey soft material and finished with golden hardware and beautiful natural bamboo handles, this is a classic style for effortless chic. We love the brand new Katie Loxton Suki Bucket Bag! New for winter, these handheld and over the shoulder bags are finished with golden loop handles to create the ultimate chic bag for winter. Choose from brilliant burgundy, classic black or pale grey. 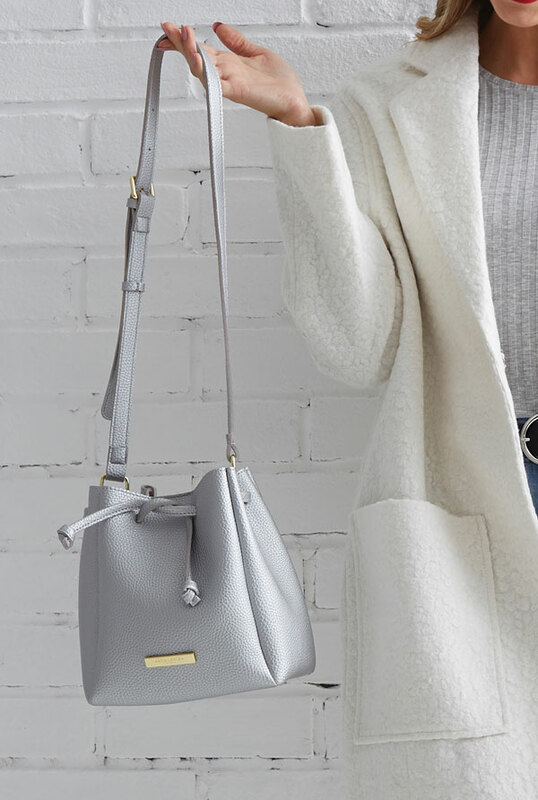 Designed to be a year-round staple, the Myla Day Bag from Katie Loxton is a totally stylish and could possibly be our new favourite crossbody bag. 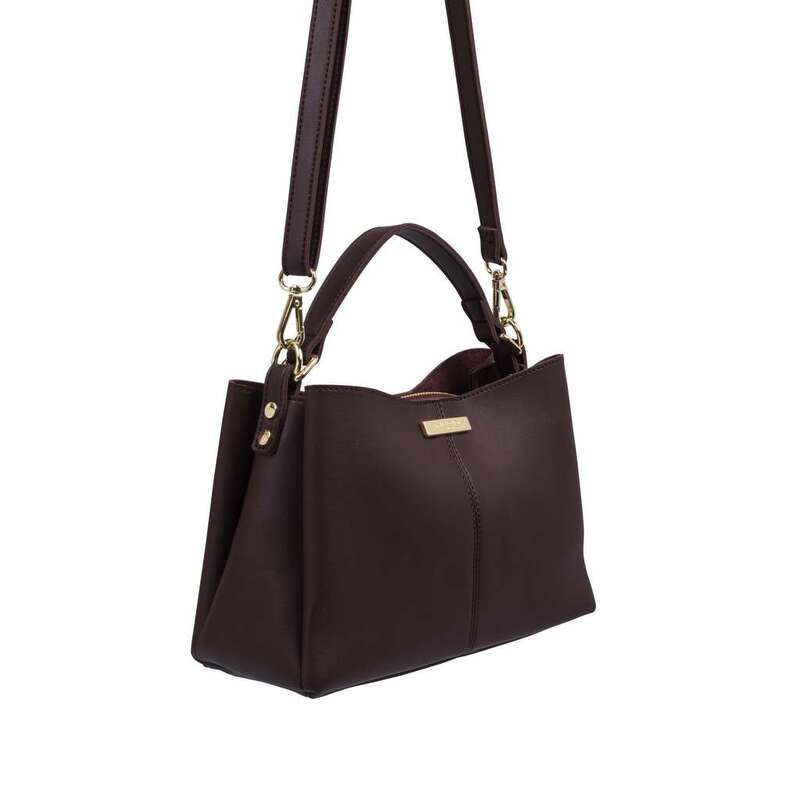 A versatile piece, featuring a short handle as well as an adjustable, removable over-the-shoulder strap. Choose from classic mulberry, metallic charcoal and black. The original collection of Loulou bags were extremely popular, so much so, we could never get! 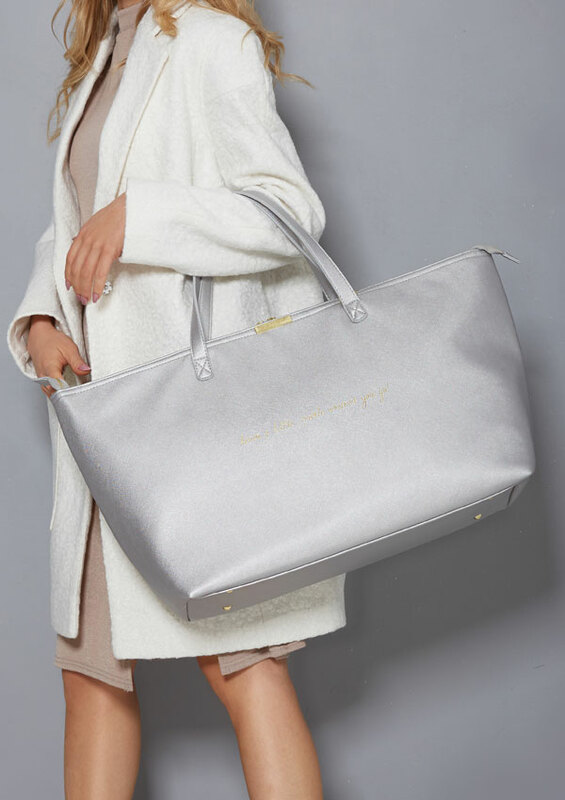 The new AW18 Katie Loxton Lune Loulou bag comes in two metallic colours with a starry feel. Featuring a removable and detachable shoulder strap with statement metal stars for that extra sparkle this season. The perfect bag bag from day to night, we simply adore these new Half Moon bags. Finished with a gold logo bar and chain strap, it’s the ultimate crossbody. Choose from a range of three new wintery hues – burgundy, black or grey. Showcasing the brand new Katie Loxton Bea back pack in a classic black, finished with a soft suedette lining it’s perfect for any daytime outfit. And a complimentary introduction to the existing grey backpack. 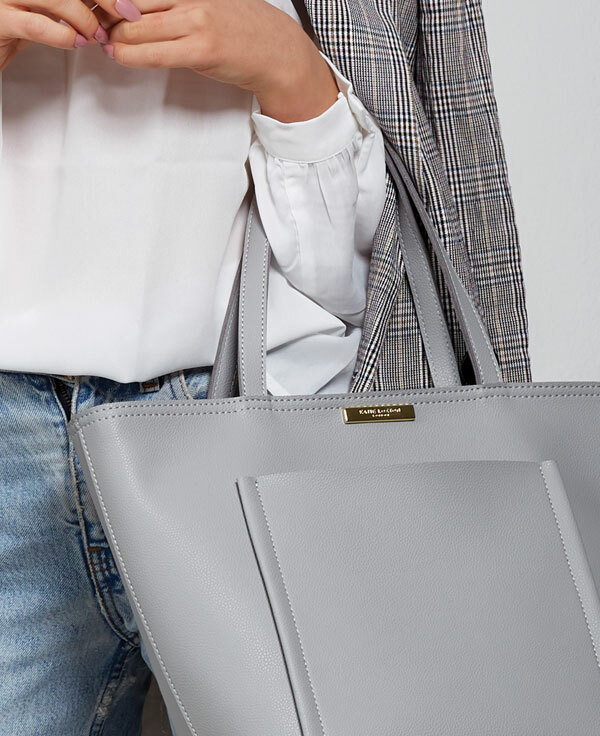 The new Alix Tote Bag from Katie Loxton is a welcome, useful addition to their collection and is available in classic black or new Dove Grey making this a go-to bag for every occasion. Leave a little sparkle wherever you go with the brand new addition to the best-selling Katie Loxton weekend bag collection, this time back in a shimmery metallic silver and complete with two shorter handles as well as a long over the shoulder adjustable strap, this bag is the ultimate accessory for your winter weekends away! 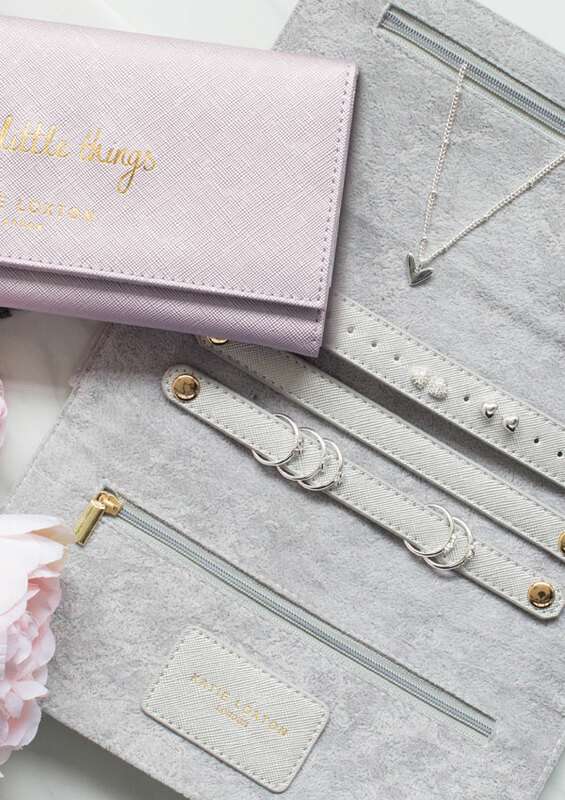 The brand new collection of Katie Loxton Jewellery Rolls makes a welcome addition to their gorgeous jewellery boxes collection. Perfect for storing your treasures on-the-go, you can choose from this season’s must-have colours metallic pink, silver or gold. We love the new Katie Loxton sentiment scarves. Bring some warmth into your winter wardrobe with the herringbone weave scarf, finished with sweet sentiments. 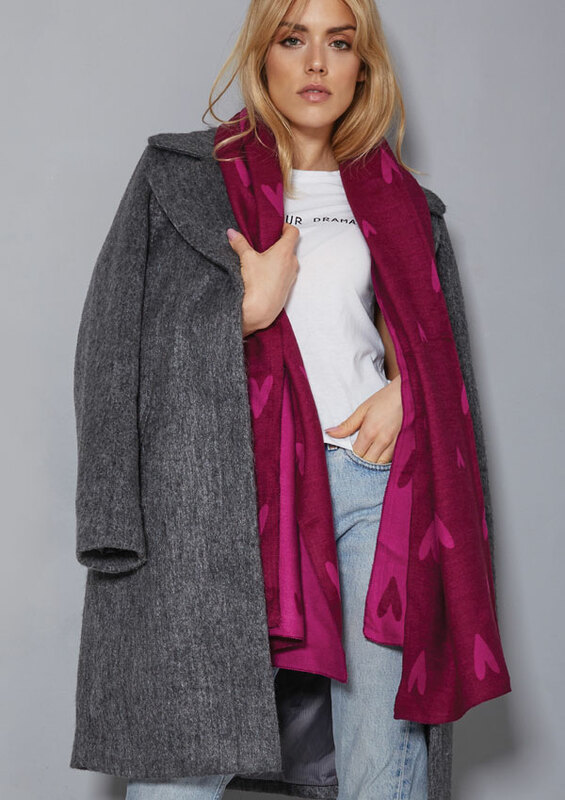 For the ultimate winter style there is nothing better than the beautiful Katie Loxton blanket scarfs. Now finished with a stunning jacquard weave pattern they are must-have for cosy every day chic!